As you know if you've read my blog for a while, we are a pork family. I have been successful with changing a lot of food habits in my family. I have started using honey and sorghum instead of granulated sugar, olive oil instead of butter and brown rice flour instead of wheat flour. As for proteins I like a varied diet. I think eating anything in large amounts isn't great, but I also don't think that eating pork and beef aren't bad for you either. According to my doctor I have some of the best cholesterol levels he has seen and I eat red meat 2-3 times a week. However, I also prepare a large amount of turkey, fish and chicken. Pork is a meat that my husband loves. In any form be it bacon, tenderloin or roast he devours it. So do my two boys. Cooking as many things from scratch as I can is important to me and one of my favorite meals to make is stew. A great stew can make even a poor cut of meat delicious and can feed my family for multiple meals. This week I tried a new recipe for Green Chile Stew from the January/February 2013 issue of the Food Network Magazine. This recipe has 14 ingredients. It takes 2 hours and 55 minutes of total time, 25 minutes of which is active and makes 8 servings. I did make a number of changes to this recipe. First I made my own chicken broth which I do not salt. Instead I salt the dish once it's done to reduce the total amount of sodium in my dishes. Second I cubed my pork instead of dicing it. I was unable to find a 3 pound roast, so I bought two smaller roasts and cut them into small cubes. I find dicing meat to be a nuisance and I prefer my meat to have larger pieces in soups and stews. Finally, I changed the overall cooking time. The recipe only cooks the pork for slightly over an hour. To me that isn't long enough to produce a great flavor. Instead I added 8 cups of chicken broth to the pork and allowed it to cook for an hour, then added the hominy and let it cook for another hour. Then I added the potatoes and let it cook for a final 40 minutes. The end result was flavorful and perfect. Since I eat gluten free I served the stew with corn tortillas instead of flour. If I had made this just for adults I would have made it spicier by leaving in the seeds on the peppers. Since I was cooking for my kids I seeded the peppers. My husband's only complaint was that it wasn't spicy enough, but that is normal since I have to keep my kids tastes in mind when I cook for our entire family. Make sure to add salt at the end, especially if you are using low sodium stock or make your own. I would suggest using additional chicken stock instead of the water suggested in the second part of the recipe. The water would make the soup less flavorful. 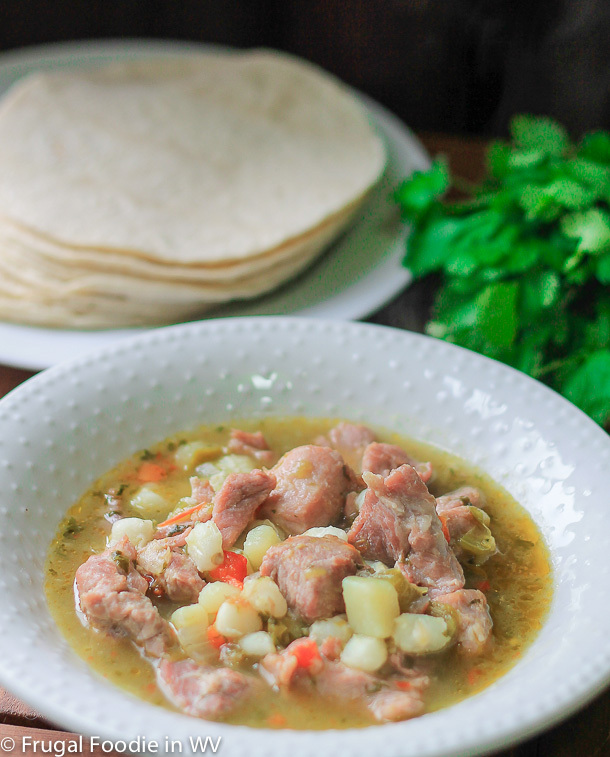 For the recipe go to Green Chile Stew. Looks like a good excuse to try hominy! Hominy really is great in stews! I like pork too but not really in soups or stews, but this looks good. Looks wonderful! It is great to stew recipe with pork in it. I hope you have a terrific day. Thanks :) I hope you had a great day as well! Me too, they are delicious! We're not really big on pork in our house, but I like that this doesn't seem too spicy. No one but me would eat it if were too spicy! I always buy a bigger roast than we need also and then cut it in half for two meals. Pork can be really versatile in soups and stews! I am a huge pork fan so I know I would love this. It really sounds fabulous! I'm a huge pork fan also, it is yummy! Our family loves pork, too. We had them baked in the oven with mushrooms last night. You've got some great recipes that I hope to try! I love mushrooms, I bet it was yummy! I will chime in on the pork .. I mean you cant go wrong. This look amazing and perfect for this chilly weather! Thanks :) It really is great when it's cold outside! Yummy! I'm not a big pork eater, but my fam is. I'm always looking for easy ways to get them their pork! My family loves pork too :) This recipe really is easy and make enough for multiple meals, which is nice!